It was supposed to be the night Floyd Mayweather Jr. squared off against Manny Pacquiao. Instead, 50,992 fans filled Dallas Cowboys Stadium to witness Manny Pacquiao against Joshua Clottey in a fight billed as "The Event". Unfortunately, for the stadium crowd and the thousands watching on HBO PPV, the fight looked like a one-sided sparring session with Pacquiao dominating. On the contrary, it was not Pacquiao's fault that Clottey was unwilling to engage. Did Joshua Clottey forget he was in a fight? Manny Pacquiao (51-3-2, 38 KO's) easily defeated Joshua Clottey (35-4, 20 KO's) for his twelfth straight victory by the official scores of 120-108 and 119-109 twice. Pacquiao overwhelmed him with blistering combinations the entire fight. As Clottey pressed forward, Pacquiao simply stepped to the side and unleashed a barrage of punches. Clottey never had an answer for Pacquiao's whirlwind attack. Whether it was Pacquiao's tornado punching or just Clottey's reluctance to throw punches, Pacquiao had an easy night of work. 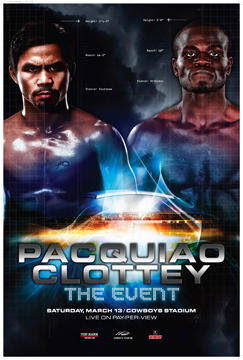 Pacquiao displayed an excellent performance, but Clottey's inability to fire punches made it look much more brilliant. In the 1st round, Pacquiao moved in and out, scoring with straight lefts and combinations to Clottey's body. Clottey held his hands extremely high. Pacquiao tried to lower Clottey's hands by viciously assaulting his body. It is unclear how damaging Pacquiao's punches were because Clottey showed a tremendous defense. Pacquiao scored with some shots, while others simply hit Clottey's arms. In the third round, Clottey connected with a left uppercut and followed it with a left hook to the body. Then, Clottey landed a hard right. Pacquiao countered with the right hook. After Pacquiao absorbed a punch, he answered quickly by firing multiple punches. Later in the round, Pacquiao threw a left uppercut that cut through the guard of Clottey. Pacquiao continued to blitz Clottey with punches in round four. Again, it was unclear how many shots were hurting Clottey because he kept pressuring Pacquiao. In round five, Pacquiao's punch output slightly dropped, which enabled Clottey to land some right hands. Pacquiao stepped up the action in rounds six and seven, landing hard shots to the body and following them up with punches to Clottey's head. Clottey briefly dazed Pacquiao when he connected with a left uppercut in round ten. Clottey caught Pacquiao with another left uppercut in the eleventh round, but Pacquiao responded by swarming him with hard, crisp punches from a variety of different angles. For a fighter hesitant to throw many punches, it was interesting that Clottey landed cleanly with the few punches he unleashed. Sometimes, Pacquiao momentarily stood in front of him without throwing. Throughout the majority of the bout, however, he was using superior lateral movement and struck Clottey repeatedly. After the fight, Clottey's face showed little damage. On the other hand, Pacquiao's right ear was swollen and his right cheek sustained a small cut with minor swelling. For a guy that clearly won no less than 11 rounds, it was astonishing to see Pacquiao bruised. If Pacquiao was fighting someone that could match his speed, power and fluid punching, would he have been as dominant? Now, we are back to square one. The world is clamoring for a Manny Pacquiao - Floyd Mayweather Jr. showdown. First, Mayweather needs to defeat Shane Mosley on May 1st, which is no easy task. Although Mayweather is a slight favorite heading into the bout, Mosley will be a difficult opponent. Mosley has the ring intelligence and the overall skills to pull off the upset. If Mayweather beats Mosley, can Mayweather and Pacquiao come to an agreement on the terms of random blood testing? Pacquiao's camp agreed to blood testing up until 24 days before the fight, while Mayweather's camp is still demanding testing until 14 days. For a discrepancy of a ten day span, they have yet to reach a resolution on what could possibly be the largest grossing fight in the history of the sport. Manny Pacquiao, Floyd Mayweather Jr., HBO, Golden Boy Promotions and Top Rank owe this fight to the fans, who are more than willing to shell out their hard earned money for this mega-fight. Mayweather vs. Pacquiao is truly "The Event". 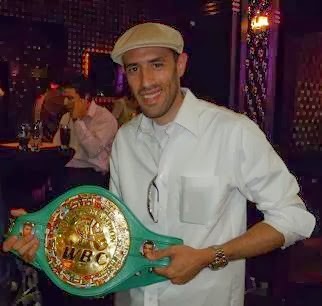 In a lightweight bout, Humberto Soto (51-7-2, 32 KO's) captured a vacant WBC title by defeating David Diaz. Official scores were 115-111 and 117-109 twice. In the first round, an accidental headbutt caused a cut above Diaz's right eye. Later in the round, Soto dropped Diaz with a right - left hook combination. Soto landed the the quicker, sharper punches in the fight. As the fight evolved, Diaz came forward with his jab more, which enabled him to land straight lefts and right hooks. Soto seemed to lose his rhythm briefly in rounds four and five. In round six, Diaz got Soto on the ropes and landed a right hook to the head. Diaz was pressing the action in round seven, however, Soto connected with the cleaner shots. Soto caught Diaz in the eighth round with a left uppercut as Diaz was charging toward him. Diaz was assaulting Soto's body in the tenth round, but Soto was hitting Diaz repeatedly with crisp head shots. In round twelve, Diaz hit Soto below the belt. When the action resumed, Diaz snapped Soto's head back with a right uppercut. Then, Soto countered with a left uppercut followed by a right hand. At this point, Diaz exhibited tremendous swelling around both eyes. Just before the bell sounded to end the fight, Soto floored him for the second time with a right hand - left hook combination. In a welterweight bout, Alfonso Gomez (22-4-2, 11 KO's) forced Jose Luis Castillo (60-10-1, 52 KO's) to quit on his stool after 5 rounds. In the first round, both fighters started slow, but Gomez used a lot of lateral movement and angles as Castillo pressed forward. Castillo stepped up the pace in round two, landing lefts hooks and short left uppercuts. However, Gomez was outworking him by throwing more combinations. Gomez, 29, was progressing and Castillo was fading as each round passed. In round four, Gomez bloodied Castillo's nose and mouth. Then, in round five, Gomez connected with a hard right uppercut and rock-solid overhand right that snapped Castillo's head back. Clearly, Castillo has seen better days and was trying vigorously to execute his game plan, but at age 36, his reflexes have vanished. John Duddy (29-1, 18 KO's) defeated Michael Medina (23-2-2 18 KO's) by a ten round split decision. Official scores were 96-93 twice for Duddy, and 96-93 once for Medina. In the first round, Duddy used better head movement than he has displayed in his previous fights. He demonstrated a solid body attack in the early rounds, and thoroughly outworked Medina in round two. While Duddy's defense has somewhat improved, the light-hitting Medina caught Duddy with very clean right hands toward the end of several rounds. In round six, Duddy hurt Medina with a left hook to the body, but Medina continued to pressure aggressively. Just as round seven ended, a left hook followed by a right hand from Medina buckled Duddy. Both fighters went toe-to-toe in the eighth round. In round ten, Duddy started assertively, but Medina struck him with left uppercuts, overhand rights and left hooks. Duddy countered with left hooks of his own. Then, about ten seconds before the bell sounded to end the fight, Medina got Duddy on the ropes and unleashed a series of rights and lefts.